Citation: Dubey S, Piplani P. QSAR Studies of Some Synthetic Structurally Related Androstene Derivatives as Anti- Inflammatory Agents. Chem Inform. 2015, 1:2. The use of steroids in the acute and emergency conditions of inflammation is well established. Most of the time they are given chronically to the patients with arthritis. The present study focuses on developing substantial quantitative structure activity relationship models of certain steroidal derivatives reported to be as anti-inflammatory agents. The QSAR models of androstene derivatives were developed using ED50, log ED50 and 1/log ED50 values of anti-inflammatory agents. The models developed have shown significant correlation between the anti-inflammatory activity and some of the structural parameters. The best fit model has shown r2 of 0.9081, q2 of 0.8310 and F-values of 29.6585. Drug designing is a continuous and iterative process, which starts with some lead molecule of interesting biological profile and ends with the optimization of this lead, leading for the selection of candidate molecule for drug development . Computer aided drug design has received considerable and justified attention in recent years. Quantitative structure-activity relationship is an area of research pioneered by Hansch and Fujita , is based on the concept that there is a relationship between properties of compounds (biological activity, etc.) and the structure of the molecules of those compounds. Since then QSARs methods have been extensively applied in a drug discovery, toxicity prediction and regulatory decisions. The increase in the use of QSAR early in the drug discovery process as a screening and enrichment tool helps in the elimination and further development those chemicals that lack drug-like properties. It attempts to model the activity of a series of compounds using measured or computed properties of the compound. Since 1949, when Hansch described the use of coricosteroids in rheumatoid arthritis, they have become very useful in the management of many different rheumatic conditions. Corticosteoids like Beclomethasone, Betamethasone, and Cortisone etc. show complex antiinflammatry and immunomodulatory effects . They inhibit the migration of leucocytes to the sites of inflammation and interfere with the function of leucocytes, endothelial cells and fibroblast. They also suppress the production and release of factors involved in inflammatory responses such as cytokines, prostaglandins and leukotrienes [4-6]. A large number of steroidal anti-inflammatory agents have been designed and developed by our group since a long time. It was planned to investigate in-silico prediction of activity, i.e., QSAR among these synthesized steroidal antiinflammatory agents. The original Hansch work used multi linear regression (MLR) analysis to combine different descriptors in data set. In our present study we have made use of BESERGMS (Best-multi linear regression) analysis. The activity of synthesized compounds was calculated experimentally using rat-paw odema method . The lipophilic parameters were calculated theoretically using Pallas 20, Hyper Chem. Various other descriptors were explored using software like Chem 3D, codessa etc. The 3D descriptors were determined with the help of Dragon software. QSAR models were developed using BESREGMS option built in Codessa software and cross validation was done using Leave-one-out (LOO) method. To develop a QSAR models for newly synthesized 16-(2-and 3-pyridylmethylene) androstene derivatives, Chem 3D, Dragon and Codessa software were used. The total of about 1897 different descriptors physicochemical, topological, geometrical, constitutional, 2D and 3D descriptors were calculated and these number of descriptors were reduced to final set of 97, by rationally stepwise elimination of lesser significant ones based on their one parameter and multiparameter r2 values. In subset only those descriptors were choosen which were having r2 ≥ 0.1. The heuristic method was used as final statistical tool for developing QSAR relations using the software Codessa. In case of heuristic method, a pre-selection of descriptors was accomplished. All the descriptors were checked to ensure that value of each descriptor was available for each structure and there is significant variation in these values. Descriptors for which values were not available for every structure in the data in question were discarded. Thereafter, the one parameter correlation equations for each descriptor were calculated. The maximum number of descriptors involved in a correlation was choosen in accordance with the ratio of number of compounds to number of descriptors as 4:1. As a final result, the heuristic method yields a list of best ten correlations each with highest r2 and F values. Many such attempts were carried out to obtain significant correlations for each congeneric series. The statistical significance of each correlation was determined on the basis of the value of F-criterion and magnitude of cross-validated r2. In the next step, predictive ability of the equation is tested with the help of LOO method. The structures of the series of androstene derivatives 54 DP, 59DP, 60DP, 62DP-72DP, 76RG, 87RG and 88RG which were synthesized in our laboratory [8-12] are given in Figure 1. The results of their anti-inflammatory activity, determined using rat-paw odema method in terms of ED50, log ED50 and 1/ED50 values are given in Table 1. Despite having similar steroid backbone, changes in molecular structure among these therapeutic corticosteroids result in significant variability in activity. 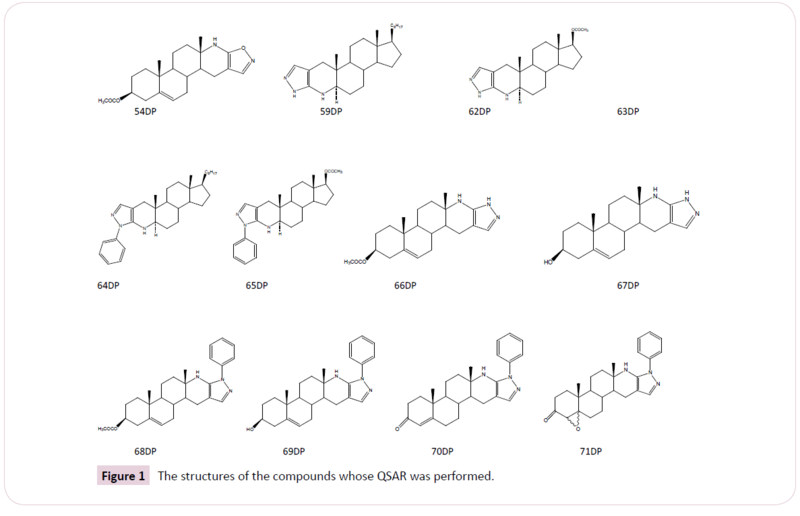 Figure 1: The structures of the compounds whose QSAR was performed. Table 1: Showing the ED50, log ED50 and 1/ED50 values of the compounds. A total of about 1700 different descriptors physiocochemical, topological, electrotopological, geometrical, constitutional, 2D and 3D descriptors were calculated by the software: Pallas 20, hyperchem, Chem3D, Dragon and Codesssa. The Number of descriptors was reduced to final set of 64, by rationally stepwise elimination of the insignificant ones based on their one parameter and multiparameter r2 values. In sub set only those descriptors were chosen which were having r2 ≥ 0.1. The heuristics and multi linear regression analysis (MLRA) was used as final statistical tool for developing QSAR relations using the software Codessa. The final QSAR models, along with their respective q2, r2, F-value and probability factor are given in Tables 2-4. These relations all appeared to show significant correlations (r2 range 0.7002 to 0.98084) and good predictivity performance (q2 range 0.6011 to 0.8573). Table 2: Significant linear and logarithmic QSAR polynomial equations along with the statistical parameters for a series of steroids using antiinflammatory activity as property parameter. anti-inflammatory activity as property parameter. Table 4: Significant linear and logarithmic QSAR polynomial equations along with the statistical parameters for a series of steroids using reciprocal of anti-inflammatory activity as property parameter. The steroids represent a class of compounds with numerous and widespread biological effects, anti-inflammatory activity being one such important effect. Among themselves steroids can vary markedly in their efficacy, adverse effect, pharmacokinetics and pharmacodynamics. There is a continued interest in the development of potent anti-inflammatory steroid. In our present study, QSAR models have been developed that are based on molecular, submolecular, physicochemical, 2D and 3D properties obtained from the various software. In contrast to using the entire the matrix of structural parameters as in PLS analysis and automatic forward inclusion MLR technique was used to arrive at the primary property determinants with minimal number of independent variables or descriptors. We are thankful to Centre for Scientific and Industrial Research, New Delhi, India for providing the financial support. Hansch C, Kurup A, Garg R, Gao H (2001) Chem-bioinformatics and QSAR: a review of QSAR lacking positive hydrophobic terms.Chem Rev 101: 619-624. HanschC, Leo A (1979) Substituent Constants for Correlation Analysis in Chemistry and Biology, John Wiley & Sons, New York, USA. Patrick L,McGeer,Schulzer M, Edith G (1996) Arthritis and anti-inflammatory agents as possible protective factors for Alzheimer's disease. Neurology 47:425-432. Taylor P (1985) In Goodman and Gilman's The Pharmacological Basis of Therapeutics, (7thedn) Gilman AG, Goodman LS, Rall TW, Murad F (eds.) Macmillan: New York.p:222. Dimeloe S, Nanzer A, Ryanna K, Hawrylowicz C (2010) Regulatory T cells, inflammation and the allergic response—The role of glucocorticoids and Vitamin D. The J Steroid Biochem and MolBiol120:86-95. Haeggström JZ, Funk CD (2011) Lipoxygenase and Leukotriene Pathways: Biochemistry, Biology, and Roles in Disease. ChemRev111: 5866-5898. Winter CA, Riselay EA, Nuss GW (1962) Carrageenan-induced oedema in the hind paw of the rats as an assay for anti-inflammatory drugs.ProcsocExpBiol Med 111: 544-547. Marshall IG, Paul D, Singh H (1973) Some actions of 4,17a-dimethyl-4,17a-diaza-D-homo-5alpha-androstane dimethiodide (HS-342), a new neuromuscular blocking drug. J Pharm Pharmacol 25: 441-446. Marshall IG, Paul D, Singh H (1973) The neuromuscular and other blocking actions of 4,17a-dimethyl-4,17a-diaza-d-homo-5-androstane dimethiodide (HS-342) in the anaesthetized cat. Eur J Pharmacol 22: 129-134. Marshall IG, Harvey AL, Singh H, Bhardwaj TR, Paul D (1981)The neuromuscular and autonomic blocking effects of azasteroids containing choline or acetylcholine fragments.J Pharm Pharmacol 33: 451-457. Singh H (1986) Somecns depressant steroidal tetrazoles.Indian J Pharm Sci 47: 29. Singh H, Paul D (1974) Steroids and related studies. Part XXV. Chandonium iodide (17a-methyl-3ß-pyrrolidino-17a-aza-D-homoandrost-5-ene dimethiodide) and other quaternary ammonium steroid analogues. J ChemSocPerkin Trans 1: 1475.